Yeah, yeah. I’m sure all of you out there are pretty pumped about the upcoming DC Restaurant Week—so am I, I assure you. But don’t be so quick to forget another annual week-long extravaganza — Shark Week! Every year since 1987, the Discovery Channel has taken on the summer TV slump with a celebration of the shark, and man, is it some compelling television. Being at the top of the food chain of the planet’s biggest biome, there is much a foodie can respect and empathize with in this merciless killer. Like the foodie, the shark is voracious, but also open minded — from Tuna Sashimi to Seal Tartar, the shark is in, full bore. Also, he is not one to scoff at ethnic cuisine: whether Australian, Indian, or American, everyone is on the menu. That said, the Discovery Channel pulls no punches, depicting the brutal life of these prehistoric killers in a very visceral manner—your gonna need a drink to steel yourself. Fortunately, there are a couple of producers out there making some great beverages that are appropriate to the occasion, and actually do a little good along the way. Shark Trust Wines, founded by avid diver Melanie Marks, in San Luis Obispo, California, presents a great line of international wines, labeled with a focus on shark education. 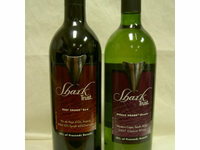 Shark Trust pulls its wine from all over the globe, with producers in California, France, and South Africa, each wine embodying the grapes and style of its origin. Right now, I am enjoying a glass of Whale Shark Chenin Blanc 2007, a sturdily made South African wine made from the county’s signature grape. Tropical fruit such as guava and kiwi dominate the nose, giving way more ripe flavors on a full-bodied palate, with a short but appropraitely acidic finish. The line also features a fruit-driven Reef Shark Red from southern France, (which I have tasted and find to be a great fruit-driven Rhone Style red), the Great White Chardonnay, and the Six Gill Syrah, all of which are well priced at about $10, of which 10% goes to shark charities. 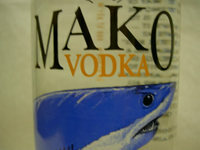 For those that prefer something a bit on the stronger side, "Take Little Bites," a company out of Jupiter, Florida, has released Mako Vodka. Founded by Long Island transplant Michael Politano in 2005, Mako Vodka seeks to "take on the big boys" like Grey Goose and Smirnoff, while donating 10% of their profits to wetlands and coral reef preservation. This three-times distilled, charcoal filtered grain vodka has a very clean profile, including hints of nuts and wheat on the nose. The body is smooth but full, almost oily, with none of that harsh vodka bite so common of spirits in its modest (about $13) price range. Regardless of your drink, this is a surprisingly palatable vodka, appropriate for tonics and martinis, and is even clean enough to drink neat. Though the Discovery Channel, Shark Trust, and Take Little Bites all take a light-hearted tack on the matter, their underlying ethos needs be noted: that our oceans and their denizens, however large, are vital and fragile, and in desperate need of our assistance. Its good to know that, thanks to certain well minded people, in some small way, we may do something for the greater good while taking our enjoyment. Cheers! Celebrating Shark Week should give you reason to dine in Discovery's surrounding sea, Silver Spring.